Ada learns fast. She has to. That’s because Ada is a frontline health worker who consults with people who are in pain and feeling unwell. To do her best for her patients, Ada needs to know all the relevant medical basics. She must ask the right questions and analyze in minutes whether the symptoms suggest a serious illness, if she should bring in a doctor; or alternatively, if a few soothing words, a day in bed, or a trip to the pharmacy are enough to treat her patient. Ada does not have a medical qualification or even a university degree. Everything she knows she learned in a Berlin backyard from entrepreneur Daniel Nathrath and his team. Ada’s creators have programmed her to be a health consultant and trained her with the combined knowledge of more than 70 physicians, mathematicians, data scientists and computer scientists. By now you may have realized that Ada is not human but an Artificial Intelligence (AI). Surgeon console: The surgeon operates the Da Vinci system: their manual movements are translated seamlessly into robotic surgical operations in real time. Vision system: Equipped with a high-def 3D endoscope and image-processing equipment that provides true-to-life anatomical images. 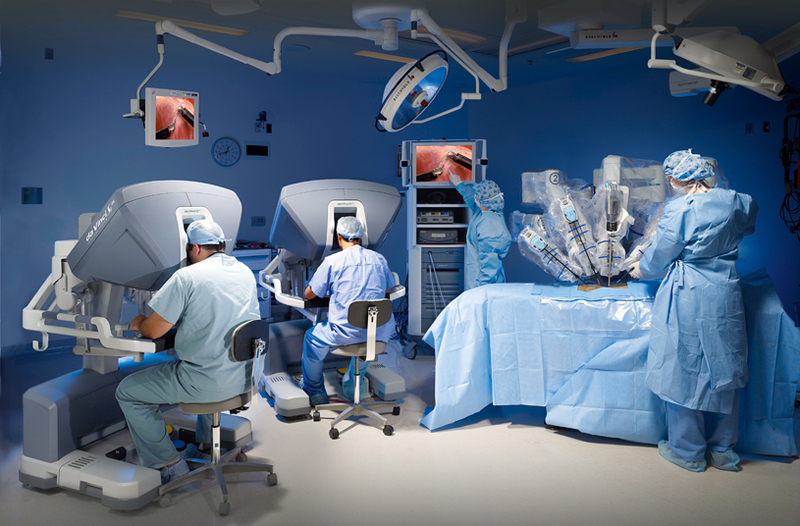 Patient-side cart: Positioned where the patient is during surgery, the machine has up to four robotic arms to carry out the surgeon’s precise commands. Endowrist instruments: Each has seven degrees of motion and is designed for a specific task e.g. clamping, dissecting, suturing. Ada is just one of many examples of innovative startups under the Künstliche Intelligenz (KI) “Made in Germany” banner, whose pioneers of future tech are revolutionizing whole sectors and attracting investment from all over the world. Supporting the new generation are research institutes like the German Research Center for Artificial Intelligence (DFKI), where scientists and companies have been working together since the 1980s to teach machines how to think. With more than 900 employees, DFKI is the world’s largest research center in this field. It has spawned more than 80 spin-off companies and has big league partners and shareholders such as Airbus, Nvidia, Intel, Google, Microsoft and Ricoh. Germany’s younger research clusters such as Cyber Valley in southern Germany are also gaining influence and considerable momentum. Founded just two years ago by the Max Planck Institute for Intelligent Systems (MPII) together with auto groups Bosch, Daimler, BMW and Porsche, the cluster has just secured €1.25m investment from Amazon for a research cooperation. The U.S. giant has also established its own AI research center in Tübingen. “Research into artificial intelligence in Germany clearly focuses on the question: how can AI make internationally successful German industries, services and products even better?” explains the managing director of GTAI Robert Hermann. This focus on AI applications is one of the key strengths of German research and development (R&D). “With regard to AI, the boundary between basic research, application-oriented research and transfer to industry is fluid,” says Hermann. The development of machine learning technology is progressing so fast that there may only be a few months between the idea stage and a first application. “Many AI applications have what it takes to make a profound change to entire industries and branches once they pass the field test,” he adds. of German employees think that the economy and society at large are going to benefit from AI. The number of times AI is mentioned in the coalition agreement of the German governing parties CDU/CSU and SPD. 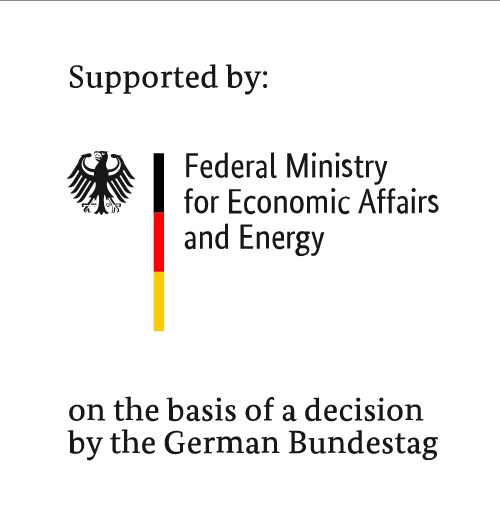 of public funding to flow into four new AI clusters/R&D centers in Berlin, Dortmund/St. Augustin, Munich and Tübingen from 2018. A study by the consulting firm PwC concludes that the growth potential for the global economy through innovative products that use AI, combined with gains in efficiency, could reach €13.4tn by 2030. In Germany alone, GDP will rise by 11.3 percent over the same period thanks to developments in intelligent technology. 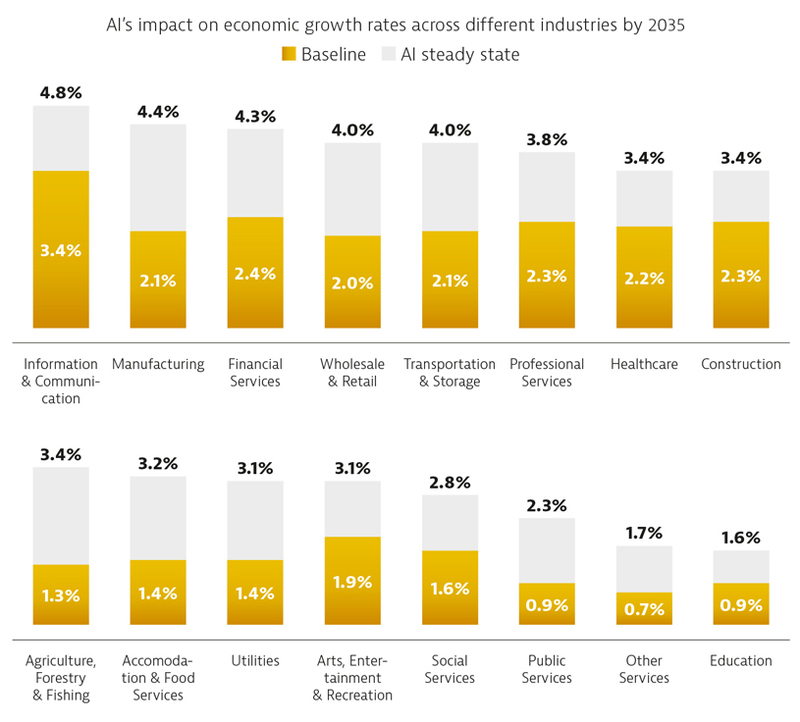 The study identifies a large proportion of industries within Germany (healthcare, energy and the auto industry in particular) that will benefit from significant productivity gains by adopting AI applications. Unsurprisingly, there has been a surge in interest in joint research projects from the corporate sector and foreign investors. From machine tool manufacturers to medtech application developers, makers of household appliances through to energy suppliers, companies are queuing up to find out how their products and services could be improved with AI. “There are also many exciting German AI projects in the field of Industrie 4.0,” says Hermann. In factories, for example, intelligent machines can now evaluate the data from thousands of sensors to optimize production and improve product quality. Meanwhile, businesses and scientists are testing the use of collaborative AI robots and linking augmented reality technology to AI-based production planning systems. A number of trending tech topics come together in the German automotive industry. Global groups such as Volkswagen, BMW and Daimler are investing heavily in modern, AI-controlled factories. At the same time, manufacturers are working on solutions for assisted and autonomous driving, intelligent operating systems, entertainment systems and navigation systems at their German R&D centers. The auto companies are open to collaboration on joint development projects with foreign partners and investors. One of China’s largest virtual reality companies, 51VR, is planning to invest in an R&D facility in Frankfurt, for example. 51VR uses software developed for the gaming industry to create elaborate virtual realities that are hardly distinguishable from the real world. It now wants to combine these virtual worlds with artificial intelligence – hence their interest and investment in projects in Germany. 51VR’s core concept is that intelligent machines can test their skills and train in virtual reality environments. Just as human beings acquire skills by interacting with the real world, AI machines will be able to practice decision making and action patterning in a complex VR environment that mimics the real world. This could have benefits for German car manufacturers, who could train intelligent navigation and control systems for their vehicles in the virtual traffic of a 51VR programmed model. Potential growth of the German economy by 2030 resulting from adoption of AI technology, applications and services across all sectors. As a location for AI innovation, Germany has the great advantage of having a large pool of highly trained specialists and experts. They then team up with the entrepreneurs and startups that are clustered around the universities and research institutes (see map “Germany’s AI Clusters”). “Germany also attracts many foreign researchers and specialists, because they find good working and living conditions here,” says Ada Health’s CEO Nathrath. His team in Berlin employs mathematicians, software engineers, physicians and data scientists from all over the world. “We receive inquiries from entrepreneurs, insurers, scientists and health policy-makers around the world who want to collaborate with us to work together to develop smart solutions for the healthcare systems of the future,” he says. “We are convinced that over the next few years we will be able to further extend our lead in Germany through our very good research infrastructure in the field of AI.” Intelligent assistants such as Ada, the German health assistant, could soon find job opportunities opening up all over the world.